Did you know that Botox is used for more than wrinkles? Botox was actually first used in the 1980's to help treat children with strabismus "crossed- eyes". Neurological conditions such as cervical dystonia, blepharospasm, focal muscle spasticity (e.g. from a stroke or brain injury, childhood cerebral palsy), hemifacial spasm, are all Health Canada approved for Botox treatment. In the dermatology area, it is also approved for hyperhidrosis (excess sweating) and cosmetics (wrinkles). Emerging research supports its use for chronic pain including migraine headaches, myofascial pain, neuropathic pain and even arthritis. In the early 1990's, a dermatologist noted that the patients treated by his ophthalmologist wife for blepharospasm (twitching eyelids) had less wrinkles. This led to the whole "cosmetic industry" use of Botox. In the mid 90's, an ENT specialist reported that patients getting Botox for wrinkles had less migraine headaches. This led to an explosion of research in the area of pain including myofascial pain, low back pain, fibromyalgia, arthritis (with joint injections) and neuropathic pain (with skin injections). Based on strong clinical evidence, the FDA (USA) approved Botox for chronic migraine headaches in November 2010. 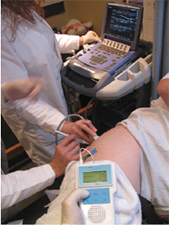 Health Canada has also approved as of October 19, 2011. A new German Botox known as Xeomin is also now available in Canada. Is Botox the new "aspirin" of the decade? 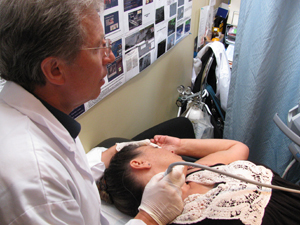 Chiropractor Dr. Gord Lawson using ultrasound to assess the neck muscles for Botox injection. Dr.Ko with RMT osteopath Rob McDonald doing Botox injection. Botox injection for low back pain. This site was developed by Benson Lam. Special thanks to Cindy Ho.